NEW YORK, Oct. 30 /CSRwire/ - Over 75% of Americans think companies can be more talk than action when it comes to supporting social issues, according to Changing Our World’s latest report, “The Authenticity Opportunity.” The report, based on a new study of Americans aged 18-65, explores people’s perceptions of and expectations for authenticity in corporate citizenship. As more and more companies push their support for social issues into the spotlight, the study finds that many Americans are skeptical that companies actually do what they say and that consumers and employees will reserve their loyalty for those companies which they believe are genuinely committed to making a difference. Most Americans (70%) still believe companies should support social issues and causes, but the research reveals the importance of authentic engagement with social issues. Nearly 70% of people will endorse a company that they believe is genuinely committed to making a difference in society, while 67% will speak out against a company they don’t believe is authentic in its actions. Stakeholders’ trust and loyalty is on the line. Consumers will boycott (61%) and speak out against (67%) a company that is inauthentic in its citizenship efforts. Younger generations, specifically, prioritize a company’s social commitments when searching for a new job. On the other hand, consumers and employees are eager to reward companies for authentic citizenship efforts. More than seven in ten people will purchase a company’s products over those of a competitor based on the company’s authentic commitment to social issues. When employees believe their own employer is genuine in its efforts, nearly 75% will recommend the company as a good place to work, and nearly 60% will put in extra effort on the job. “The data shows a cautionary tale, but also presents a tremendous opportunity for companies to get ahead by embracing an authentic approach to supporting causes and communities,” says Crimmins. There is clear value in authentic corporate engagement with social issues, but that authenticity must be earned. 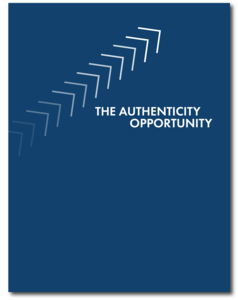 The research shows agreement – across gender and age groups – on what an authentic approach means. Americans expect companies to be “all in” for the causes they support by maximizing and strategically leveraging their assets, and adopting a strategy that is designed for longevity. And when a company’s good work leads to endorsement from third party advocates such as nonprofit organizations, consumers are much more likely to buy in. Changing Our World (www.changingourworld.com) is a trusted social impact consulting ﬁrm that advises leading corporations and nonproﬁt organizations. From fundraising to corporate citizenship, our diverse practice areas are bound by a common commitment to help our clients succeed so that they can do more good in the world. The Corporate Social Engagement team specializes in designing and implementing strategic corporate citizenship programs that deliver social impact while driving business objectives. We focus on maximizing the ways in which a company engages with its employees, consumers, and community partners to authentically address vital social needs. Changing Our World is part of Omnicom Group Inc. (NYSE: OMC). Omnicom Group Inc. (NYSE: OMC) (www.omnicomgroup.com) is a leading global marketing and corporate communications company. Omnicom’s branded networks and numerous specialty firms provide advertising, strategic media planning and buying, digital and interactive marketing, direct and promotional marketing, public relations and other specialty communications services to over 5,000 clients in more than 100 countries. Follow us on Twitter for the latest news.